This is an English translation of the Norwegian article written by Espen Løkkevig. 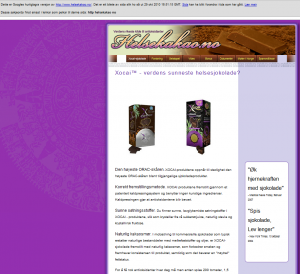 The original Norwegian article was taken down from the blog it was posted on due to threats and harrassements from the organization Sjokoservice Norge, a story you can read all about in my blog post Xocai – the nasty tale of a Norwegian chocolate mafia. New kinds of chocolate (Xocai) have recently hit the market, and are said to be healthier than the chocolates you can buy in your convenient store. This kind of chocolate is said to contain far higher levels of antioxidants than «regular» chocolate, as well as many other healthy substances. Is this correct and is it worth spending a fortune on? Read the hard facts here. Chocolate is made from the cocoa bean, one of the fruits that contains the most antioxidants. So maybe this is why it is healthy to eat so much chocolate. But it has to be dark chocolate with high in cocoa, and low in sugar and other substances to find a little healthiness in it. To se how chocolate is made, you can have a look at Nidar’s [Norwegian chocolate manufacturer] website. One of the new chocolates on the market is called Xocai (mxicorp.com) and claims to be much healthier than regular chocolate. It is, however, hard to find out why it´s supposed to be healthier. One of the claims is that is is manufactured in a new patented way. But the websites that advertise for this kind of chocolate (e.g. sjokosjokk.no) tell nothing of how it´s made. I have asked several of the people selling this chocolate and gotten some answers. But they confuse me more than they enlighten. They refer to chocolate being used as nutrition for more than 2 000 years, and that this is the reason they make this new healthy chocolate, while saying they don´t use the same process that has been used the last 2 000 years. The cocoa bean is a bitter tasting fruit that needs refining before it can be used it chocolate. Thus the Aztec invented a method of fermenting the cocoa bean to get rid of parts of this bitter taste, and dry it so it can be used for nutritional purposes. Xocai claim they skipped this method to preserve all the nutrients. This, and they use a patented cold-pressing method so secret no one can be told of it. Not even the holder of the patent or who makes it. There is no information on who makes the chocolate, patent number or anything else on the actual manufacturing of the chocolate. The only thing I have gotten to know is that it is produced in Belgium, or Canada? The sellers don´t seem to be entirely sure , for I have been told both. Not everyone is as secretive; have a look at the Nidar or Kraft Foods websites for examples of what the producers of regular chocolate tell about their methods. How are dangerous microorganisms removed I Xocai? How can you make chocolate without heating the mass? If one looks at the chocolate making process, one can see there are many steps from cocoa bean to the finished product. Part of this is shaping the actual chocolate, which is done by making the chocolate liquid and pouring it into moulds. To do this the chocolate mass needs to be heated. So whether or not they have a cold press is of no consequence, since chocolate makers need to heat the chocolate at one point or another, anyway. Another ingredient in the chocolate claimed to benefit your health is sugar! But sugar isn´t particularly healthy. It is claimed that this chocolate uses a far healthier sugar. At helsekakao.no it says one uses crystals from the juice of raw sugar cane, natural stevia (this claim has since been removed from the website – se original screenshot to the right) and crystalline fructose. Crystals from the juice of raw sugar cane is regular sugar, said in a fancy way. It´s not healthier than regular unrefined sugar. Actually it is completely regular sugar. Natural stevia is a plant that contains 300 times the amount of sweetener that regular sugar does. According to Mattilsynet [Norwegian Food Safety Authority] this sugar is illegal in Norway because of health risks [this ban has since been removed]!! There is no such thing as crystalline fructose [in Norwegian], but fructose in it´s solid form is simply fruit sugar, and isn´t a healthy sugar either. According to Mxi´s USA website, they´re not allowed to call the sugar anything but sugar. This because it is regular sugar. Not exactly the wonder remedy, then. Of antioxidants being important, there is no doubt. But there is no research that says you´ll get healthier the more antioxidants you ingest (what the directorate of health has to say about it). The various websites that sell Xocai refer to a large amount of research on antioxidants. For instance from forskning.no. The studies shown are research on chocolate and antioxidants in general, not this kind of chocolate in particular. Nor do the studies conclude that you get healthier from eating chocolate rather than fruit and vegetables (1, 2). In fact the mentioned studies show that there are elements beneficial to one´s health in the cocoa bean, but that chocolate makes you fat. As such, marketing this as a diet chocolate is a complete miss [biathlon lingo]. It is also claimed that to ingest as large an amount of antioxidants as there is in this chocolate, you´ll have to eat enormous amounts of fruit and vegetables. If you look at a regular Bocca chocolate, however, you can read that it contains 3mmol antioxidants per 100 grams. If you transfer this to a six gram chocolate from Xocai, it contains 0,18mmol antioxidants. Then one can look at the antioxidant list from Professor Rune Blomhoff at the department for nutritional sciences at the university of Oslo. 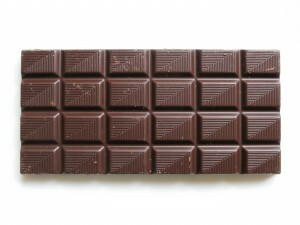 The list shows that this piece of chocolate contains as much antioxidants as 10 grapes! The people who sell Xocai have also found out what your daily need of antioxidants is, incidentally the same as the contents of three pieces of Xocai chocolate. I have not been able to find how much antioxidants you need daily, anywhere. Except the people selling this chocolate, of course, but they refuse to tell how they discovered this. In comparison; Olympiatoppen (Norwegian elite olympic sports organisation) say there is no unambiguous research that shows the health benefits of taking antioxidant supplements. So far it´s been shown that this chocolate contains nothing more healthy than what is found in other chocolates, bought in any shop. Through massive marketing, glossy pictures, fancy research and undocumented claims, Xocai are trying to convince people to believe this some kind of wonder-substance. Which it isn´t. Still not convinced this is a chocolate like any other? I have been researching the nutritional value and ingredients of this chocolate and “regular” chocolate. The content of energy, protein, carbohydrates, fat, fibre and fillers is virtually the same for all the chocolates I found with at cocoa content of at least 70%. It´s even labeled with a warning to people with allergies, like “regular” chocolate. In other words it might contain milk, traces of nuts and wheat. Still no wonder-substance to trace. They have added acai and blueberries to increase (?) the amount of antioxidants in the chocolate. As previously written on 10min.no; the health effects of this are to be doubted. The total content of powdered acai is less than 3%, anyway, and for blueberries it´s less than 1%. The marketing of this chocolate is through a pyramid-shaped organisation call network marketing. In short this means a person recruits friends and acquaintances into the pyramid, and the guy on the top makes a killing on what everyone further down the pyramid pay for expensive subscriptions to buy this claimed healthy chocolate. The people who do this also have fancy websites, they give lectures, arrange courses and meetings about the product and how to convince friends and acquaintances that this wonder-product is what it claims to be. They might also refer to a load of article, many anecdotes and generally positive review on the product. They can´t, however, document a singe claim. Not in the way the law demands, in any case, which is by scientific trials and test. There are several things they “forget” to mention. Such as this chocolate being illegal to sell in Norway. It is, according to Mattilsynet, illegal to sell products containing stevia [again; legalised since this article was written]. The claims made are also in violation of Medicinal Products Act §20 [Legemiddelloven], which says: «It is forbidden in advertisement […], directly or indirectly, to give the impression that a substance […] that is not a medication is recommended as a means to prevent, cure or alleviate illness, symptoms of illness or pain or influence physiological functions in humans or animals.» In an e-mail from a adviser in Legemiddelverket [Norwegian drug administration agency] confirms that the claims made on the website are in violation of the Medicinal Products Act. The claims are also in violation of the marketing act [markedsføringsloven] §13, that says: «Claims in marketing concerning actual conditions, hereunder concerning characteristics or effects, must be documented. The documentation must be available to the advertiser when the marketing occurs». This chocolate is incredibly expensive. In a regular store a bar of Premium chocolate from Freia costs roughly 20 kroner. This is for 100 grams. Xocai costs roughly 10 kroner for a bar of six grams. That´s a 830% price difference! (20kr/100=0.2 kr/gram, 10kr/6=1,67 kr/gram, 1.67/0.2=8.35) Since a piece costs ten kroner, it will cost you 30 kroner a day, or 900 kroner a month. The people pushing this chocolate in other words think it´s a good idea to spend 900 kroner a month on chocolate. Every month of the year. My conclusion is that this is nothing but regular, plain chocolate, though manufactured in a secret, mysterious way, and contains illegal and potentially dangerous ingredients. It´s grossly overpriced, has no documented positive effects, is made only to make money of the gullible customers and has absolutely no healing, slimming, improving or performance enhancing effect. The marketing violates several Norwegian laws, in addition to several European laws. This is a cunning and cruel way to sell a product. By promising healing effects, people with serious disease might think buying, and eating, this chocolate will make them better. Aa such someone might quit vita medication in favour of this chocolate. Does anyone really want to have a life on their conscience for a few bucks? !